Bahamas travel will let you take a journey into a real paradise where the local tropical vibe is so contagious, you would not want to leave. The best of The Bahamas is that it offers some of the top world attractions, sightseeing day tours, the most beautiful flower gardens and historical journeys. For those that love water sports, The Bahamas have got it all! Go on the adventure of your life, explore the most beautiful velvety-sand beaches, sparkling bays; and did we mention Bahamas has got a long and interesting history to share? All that, along with over 700 islands and cays, that have their own story to tell is a must-see when you are travelling to any island in The Bahamas! Why travel to The Bahamas? There are many travel destinations in The Bahamas, but the most popular ones are Freeport, located on Grand Bahama Island, Nassau, located on New Providence Island, and The Exuma. If you chose The Bahamas as your next vacation destination, rest assured you have made the perfect choice and your Bahamas travel will be fun, engaging and totally unforgettable. The Bahamas offer some of the best world class resorts and hotels that will please even the pickiest traveller. Nassau and Freeport are the two ultimate spots where all the entertainment happens and a different adventure awaits you every day. 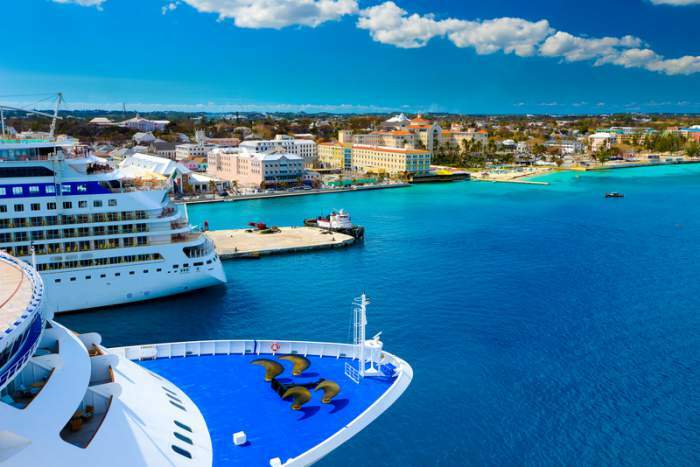 Cruises, historical tours, day trips and excursions, many fun and unmissable attractions, a variety of water sports and the best duty-free shopping is in abundance in The Bahamas. Have you ever had a chance to swim with the cute and adorable piggies? Exuma Cays in the Bahamas will allow you to experience the world's sensational attraction Swimming with the Pigs. This is the original and the most famous world destination allowing its' guests a one-of-a-kind opportunity to swim with these adorable animals while enjoying the turquoise crystal-clear Bahamian waters. If you are coming to Nassau, New Providence Island, for your Bahamas vacation, you do not want to miss exploring the Paradise Island, that is connected to Nassau by a bridge and is home to the luxurious Atlantic Paradise Island resort. It offers even more activities, luxury shopping, fine restaurants and attractions that everyone longs to see and explore. Swim with the dolphins and sea lions or explore the brilliantly colored coral reefs, coral walls and wreck dives. Check out the oldest historical ports, forts and cays. Remember, Bahamas has got over 700 islands and cays, and only about 26 of them are inhabited, so there is a lot to explore, see and do when you visit this place of heaven. 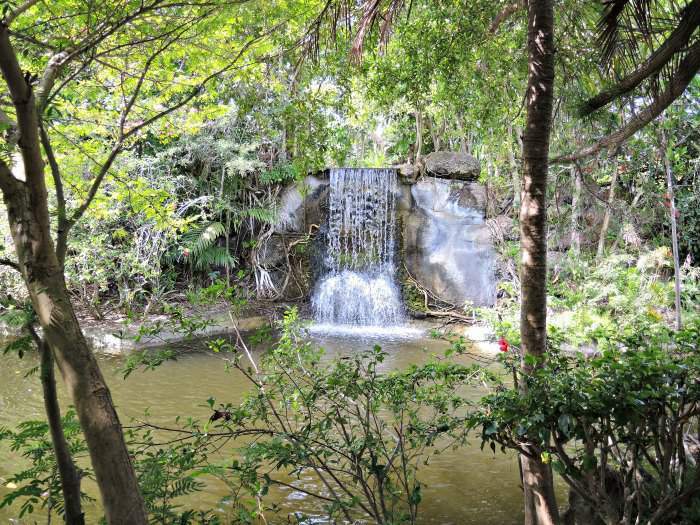 Garden of The Groves is a tropical paradise, located in Freeport, Grand Bahama island, if you choose it for your Bahamas travel. Photo by Pietro Valocchi on Flickr. 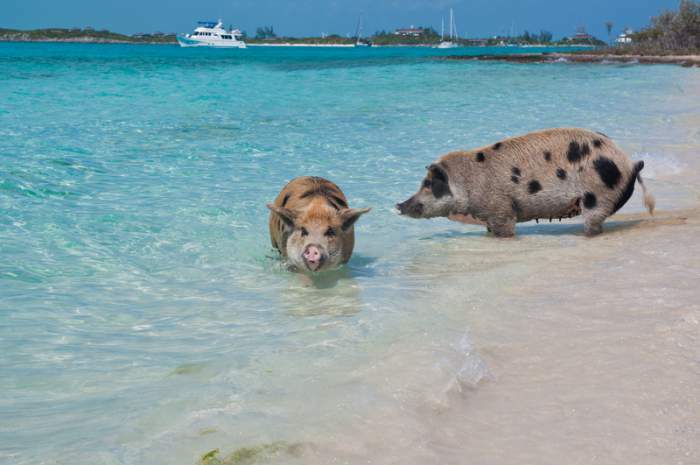 If you feel adventurous, head over to the Exuma island to see the famous swimming pigs. Airplane and ferry tours are available from Nassau and Freeport to the Exuma, unless that's where you decide to stay for your travel. Considering that the weather in The Bahamas is gorgeous throughout the year, tourists can enjoy their Bahamas travel during both the summer and winter months. November through February in fact are the busiest and the most expensive months of the year. Most resorts and hotels are booked months in advance to secure a good spot, so line-ups in car rentals, restaurants, and attractions are a common occurrence. If you visit The Bahamas during the months of March and April, be prepared to see a lot of beach parties and discos with loud music. Prices are still unreasonably high and the resorts are packed. This is not a good time for those seeking a more peaceful and relaxing Bahmas family travel. The best time to enjoy your travel in The Bahamas would be during the summer months that run from May through October. The temperatures are in their high 20s C (68+ F) and even low 30s C (86+ F), but the tropical winds make the weather feel pleasantly enjoyable. Along with fewer crowds there are many other perks for those that go on their Bahamas travel in the off-season. Many resorts and hotels give significant discounts (some even 60% off) and no need to book them far ahead. All activities, amenities, attractions and tours are easily accessible, top boutiques begin their end-of season sales and most establishments like top restaurants do not require reservations. Some hotels close for renovations and repairs, and even though it usually occurs in the months of September, October and November it's best to check this in advance. Where are The Bahamas on the map? The Bahamas are a combination of 700 islands and cays, where only about 26 of them are inhabited. 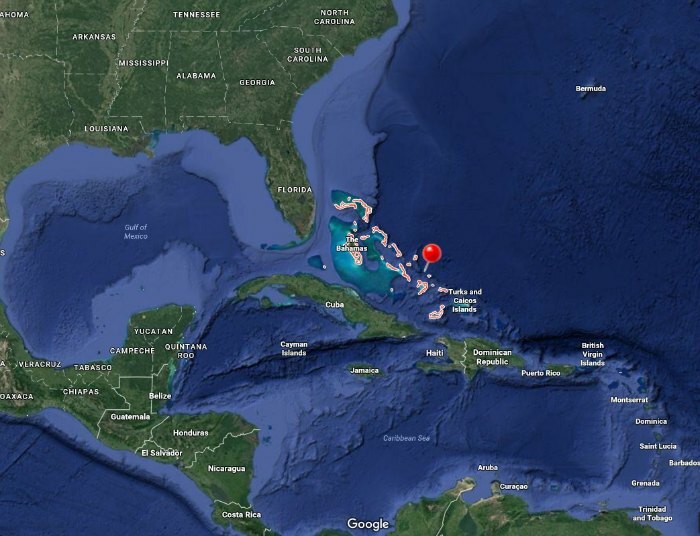 The Bahamas is located 392 km (244 miles) north of Cuba and 504 km (313 miles) southeast of Florida, in the North Atlantic Ocean. It is also a quick 45-minute flight from Miami, so expect to be in the middle of paradise in no time. New Providence Island by far is the most populous island in The Bahamas, containing approximately 70% of the total local population. It is home to the nation's capital city of Nassau and is connected to the Paradise Island by two bridges that cross Nassau Harbour. Although New Providence has the most number of inhabitants and foreign visitors, Andros Island is the largest out of all 26 inhabited islands in The Bahamas, with an area totalling more than 700 other Bahamian islands and cays combined together. Nassau, located on the New Providence Island, is the capital and the largest city in The Bahamas. Back in the days, Nassau's main harbour used to attract many settlers, especially pirates, who were the primary occupants of The Bahamas until 1718. Nassau's population in 2016 was estimated to be 274,000, meaning that about 70% of Bahamian residents live in the capital and its' close surroundings. Nassau is the commercial center for The Bahamas, with its' largest international airport (namely Lynden Pindling International Airport) located 16 km (9.9 miles) west of the capital, that has daily flights to and from the United States, Canada, UK and the Caribbean. Nassau, full of life and entertainment, offers the greatest attractions, spectacular scenery, bustling marketplaces and the abundance of duty-free shops, which make this beautiful capital a one-of-a-kind Bahamas travel spot. Paradise Island that is connected to Nassau by a bridge is a short 19 minute drive away. It is also flooded with the top activities, the best water sports, heavenly sea waters, softest beaches, and do not forget both Nassau and the Paradise Island offer the most of historical tours. Go on, explore some of the best world sites in The Bahamas! The population in The Bahamas is growing every year, and according to the latest census figures, the current 2016 population is set to be at 394,670. Bahamian ethnic groups consist of 85% black residents, 12% of white, and approximately 3% of Asian and Hispanic inhabitants. The most dominant religion in The Bahamas is Christianity. There are other religious denominations such as Baptists that comprise of 32% of the population, Anglicans at 20% and Roman Catholics at 19%, as well as a large Greek Orthodox Community. Some of the smaller faith groups include Muslims, Jews, Rastafarians and others. Bahamians are hospitable, independent and are the friendliest people you will ever meet during your Bahamas travel. They are all about joy and celebrations, and even the funerals, that are solemn and dignified occasions, always end up in family gatherings, food, drinks, music and dancing. English is the official language in The Bahamas, so not to worry, you will be able to freely communicate while on your Bahamas travel. Haitian immigrants that live in The Bahamas speak Creole; however, what you will hear most often is Bahamian English, that is a unique yet beautiful language, a mixture of dialects and idioms from English settlers and African slaves. All that, along with the island's own influence from Irish and Scottish heritage make up this cordial local Bahamian speech. Lynden Pindling International Airport, the largest airport in the Bahamas, is located in the capital city of Nassau, and welcomes all large international aircrafts coming from the United States, Canada and the UK. If you are travelling from other parts of the world, take into account that transit stops must be made before boarding a direct flight to the Bahamas. 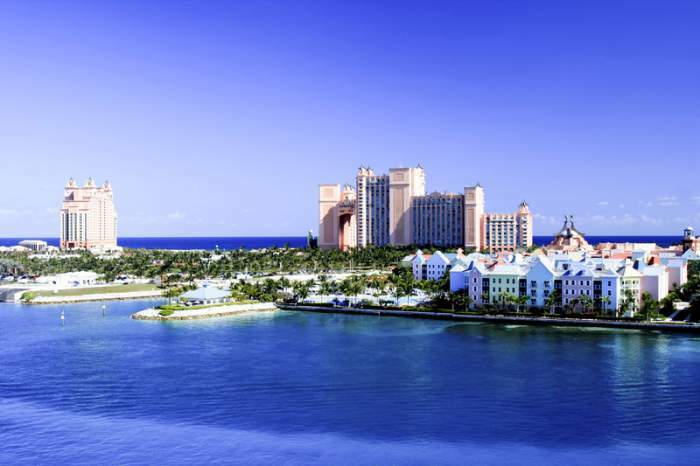 United States, Canada and the UK all have direct flights to the Bahamas' capital city Nassau. For all other Bahamian destinations, a connecting flight in the U.S. or a ferry in Miami are readily available and are at your service. For passengers that are travelling to Freeport, Grand Bahama Island ferry service is also available at Fort Lauderdale, Florida. Although the ferries run on a schedule, they can take longer in travelling time. Even though direct flights to Freeport are available from Toronto, Canada, it is advised to double check with your airline company prior to booking, as some companies make connections in the United States. Several direct flights to Freeport, Grand Bahama International Airport are available from a few major U.S. cities like Atlanta, Orlando, New York as well as from Miami. Charter flights are available practically anywhere in The Bahamas, but check with them prior to selecting this option for your Bahamas travel. Their schedules and prices vary, and it might be more cost effective to use regular means of transportation. Lucayan Harbour Cruise Facility is the official port of entry for Grand Bahama Island, and those passengers that come by a cruise ship or a ferry will arrive at this port. Prince George Dock, located in Nassau, Paradise Island, is the most popular port of entry and most world cruise liners dock their ships here. Ferry service that runs from Nassau to the Out Islands and Cays is available to those that feel more adventurous and are looking to explore other parts of this paradise on their Bahamas travel. If you are travelling from Grand Bahama Island, keep in mind that a mailboat service to Nassau runs once a week and takes about 9 hours, while a flight will only take 1 hour. Once you arrive in Nassau, you are welcome to take a ferry to other places of your choice. Nassau and Freeport provide plenty of all-inclusive luxury resorts, hotels with all-inclusive packages, accommodations perfect for couples-only, family-friendly options, budget hotels, or villas and condos for rent, that will sure please any budget, preference and style. Many tourists love the all-inclusive arrangements, because it gives a perfect opportunity to pay for your Bahamas travel in a single bill and avoid budget overruns. All the amenities, water sports, dining choices and kids' clubs are included, all you need to do is relax and let yourself savour the moments of your one-of-a-kind Bahamian paradise. Nature enthusiasts can select from a number of eco lodges that offer relaxed settings and allow their guests to do as much or as little as they like while staying there. Some of them are even all-inclusive, but all of them provide the most unique and spectacular views of the Bahamian surroundings, unspoiled and deserted beaches and even camping. An abundance of privately owned villas are also available for those seeking a more independent and secluded Bahamas travel. However, choose the rental property wisely, make sure you deal with a reputable listing agent. The weather in The Bahamas stays relatively warm all year-round, so you can plan your Bahamas travel at any time of the year. November through April are the winter months that experience little rain, low humidity and the temperatures rise up to 29 degrees Celsius (84 degrees Fahrenheit). This is the high season on the islands and many tourists travel to The Bahamas for Christmas, New Years' and March Break to enjoy some of the best attractions and water sports. January is considered to be the coldest month with the temperatures locking in at about 24 degrees celsius (75 degrees Fahrenheit), and July is known to be the hottest and rainiest month with the numbers as high as 33 degrees celsius (91 degrees Fahrenheit. May through October are the summer months in The Bahamas, and most rainfalls occur in May and June. Summer in The Bahamas brings broiling hot sun and humidity, but light tropical trade winds help to stay cool and enjoy the weather especially in the early mornings and late evenings. Temperatures during this time vary between 30-33 degrees Celsius (86-91 degrees Fahrenheit) for The Bahamas weather. The hurricane season doesn't start until June and usually lasts through November, but that doesn't mean tourists should not go on Bahamas travel during this period of time. Chances of a real hurricane are extremely low, but if they do arise, all the resorts and hotels have a cancellation policy and issue hurricane warnings far in advance. Public Transportation is readily available on all of the major islands in The Bahamas. It consists of buses (also called jitneys) and taxis. Jitneys operate from about 6:00 a.m. until 7:00 p.m. and their fares depend on the route. Bus stops are marked, and the buses only stop at the designated areas, but if you need to get off at a particular spot, let the driver know, he will let you off. Bus drivers do not provide any change, so make sure you have the exact amount when boarding the bus. Buses operate on a daily basis, with slower or no service on Sundays. Buses run frequently, especially in the tourist crowded areas, they arrive at the bus stops approximately every 10 to 15 minutes. If you want to explore Paradise island on your Bahamas travel and get a feel of the local life, buses are a perfect and affordable way to do so. Taxis is another form of public transportation in The Bahamas and can be found practically everywhere on the islands including the hotels, the airport, parked along the streets or simply by calling them. The rates are metered and fixed by the law, so you will not end up paying more than what you owe. The fares, that are very reasonable, vary depending on how far you need to travel. So before getting into the vehicle, confirm with the taxi driver on the rates of your specific destination. Renting a car in The Bahamas is always a great option as it opens up endless possibilities to explore your chosen island on your Bahamas travel. However, there are a few rules to be considered before making a choice to rent a vehicle during your travel here. Driving in The Bahamas is on the left, British style; however, rental cars might come either with the left or the right-hand side steering wheels, so remember that when driving, as most tourists need some time to get used to driving on the left-hand side of the road. Parking is expensive and sometimes hard to find, so plan that expense in your budget when travelling. The speed limit in the built up areas is 32 km/h (20 mph) and 72 km/h (45 mph) further away from the built up areas. Drivers that hold a driver's licence from their country are allowed to operate a vehicle if they are 21-25 years of age and older, depending on the specific car rental agency and their rules. When driving, be extra cautious on the corners, sudden turns and roundabouts, and if you are a pedestrian, it's even more important to check for oncoming traffic to your right. Roads in Nassau and Freeport are fairly adequate, but it's common to experience traffic congestions, especially in the downtown areas. Here, you will find that locals drive aggressively and at times do not follow the rules, so exercise caution and pay close attention to those around you during your Bahamas travel. Some tourists like to rent vehicles and explore several islands in The Bahamas. This practice is not common and is not suggested as the ferry service to transport your rented vehicles to other places will cost an arm and a leg, will take up time as car ferries do not run on a firm schedule, and many car rental agencies do not allow this. To get the best out of your Bahamas vacation, try renting cars on each island separately, it will save you a lot of money and headache. The national currency in The Bahamas is the Bahamian dollar, that is abbreviated as BSD and is equal in value to the United States dollar. For those that are travelling from the United States do not need to exchange the money, as US currency is widely accepted throughout The Bahamas. If you are travelling from other places, it is wise to exchange the money prior to your Bahamas travel. If you pay in US dollars, most places will give the change in the US money, and if you use Bahamian currency, expect the change to be in BSD as well. ATM machines are also conveniently accessible in The Bahamas. Most of them dispense Bahamian currency, except those that are located in the Casinos and Tourist Information Areas, from there you will get $USD. If at the end of your stay, you still have Bahamian dollars, the hotels and the banks will gladly exchange them for US currency. Tipping in The Bahamas is just like on most Caribbean islands. Most establishments normally add the gratuity to the bills, which varies anywhere between 10-15%; however, once you receive the bill, carefully inspect it. Some places leave the tipping up to the customer in the same proportions of 10-15%. If you find that the tipping was included in the price, but feel your server did a great job making your stay enjoyable and relaxing on your Bahamas vacation, you are welcome to tip them directly, although you are not obligated to do so. Some hotels add a service charge of 15% to their bills, but tipping maids, bellhops, porters and other hotel personnel is at the discretion of the guest. Even though the service charge is added to the bill, good service deserves good tipping. Normally bellhops and porters receive $1 per every bag they help to carry, the maids receive $2 per day while the taxi drivers and tour guides expect a tip of 5-15% from the total price. After all, tips are the livelihood of the service staff, they depend on them, please tip generously, especially for an above and beyond service. No matter what Caribbean country you visit, at some point you will come across street and beach vendors. There is no harassment from the Bahamians in general, however, some of the vendors might get a little too pushy. If you are not interested in buying any of their suggested items, simply say "No, Thank You" and move on. The largest flea market in Nassau is called Straw Market. It is an overcrowded small commercial space that has no air conditioning systems and a lot of merchants, but the best part is that you are able to negotiate the ideal price with the vendors. If you want to purchase some memorable things to bring back home from your Bahamas vacation, check the prices and bargain as it is always an option to get a better deal. Vendors that sell things like handmade jewellery, art, woodcarvings, and other types of souvenirs in their huts depend on the tourists, so it is understandable why sometimes they might seem to have a more aggressive approach to the potential buyers than usual. Massage and hairbraiding services are also available to those who are interested. The Bahamas are fairly safe and no serious precautions are needed when coming here for a travel. The very little crime that does occur, is between the locals only and in the areas very far from the tourists' resorts. Exercising regular security measures is a must when visiting any other country in the world, and Bahamas is no exception. To feel safe, keep your valuables either with you, or in the hotel safe, as petty crime sometimes can be a problem outside of the resorts. Never leave your belongings unattended on the beach or in the rented car, tag them along. If you decide to go outside of the resort in the evening during your Bahamas vacation, have someone with you, don't wander alone, especially in he dark, and always walk close to the road. To protect yourself from the southern Pacific sun, apply a lot of sunblock and make sure to always keep your body hydrated. Beachwear like bathing suits, swimming shorts and cover ups should only be worn on the beach and not outside of areas designated for swimming, water sports and enjoying the perfectly clear waters of the sea. If the beachwear is worn on the streets, the locals view it as vulgar and inappropriate, and it is frowned upon. If you follow these easy but important rules about safety during your Bahamas vacation, you are guaranteed to have a fantastic time! Tap water in The Bahamas is absolutely safe to drink; however, for those that are concerned, bottled water is readily available in local stores and supermarkets, and for free in some resorts. Tap water in the resorts and hotels goes through a filtration system and then is chlorinated, so those guests that are not used to the taste, have an option of purchasing bottled water. Electricity in The Bahamas is set at 110-120 volts and 60 cycles and all of the appliances from the United States and Canada are compatible to work on the islands. If you are travelling from Europe, please prepare the plug converters, transformers and/or adaptors to take on your trip. Keep in mind, that in rare cases, some of the older hotels might have the 2 prong plugs, rather than 3 prong. In that case a converter is required even if you are coming from North America for your Bahamas travel. Check your plugs prior to your travel to ensure properly working devices on your worry-free trip.